Today we are interviewing Katrina Cope, author of the Preteen – Spy/Sci-fi novel Taylor's Plight, book 3 of The Sanctum Series. For readers who didn’t read your last interview with us, could you share a bit about yourself? Describe the plot of Taylor’s Plight in a few sentences. 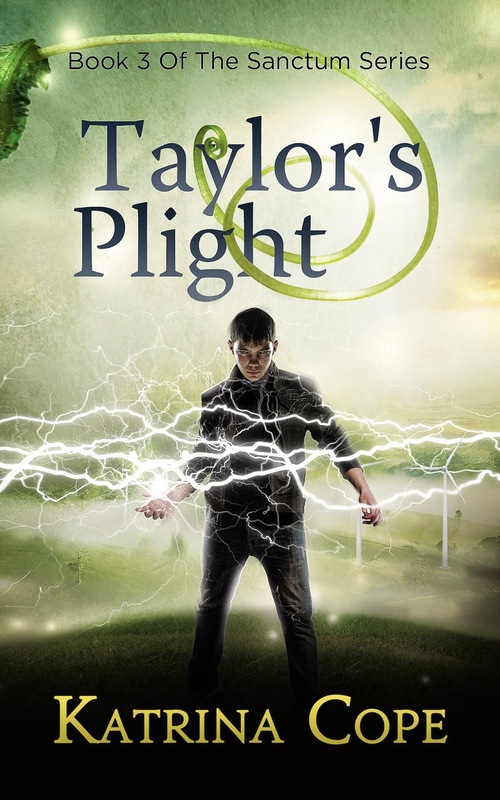 In Taylor’s Plight the action is increased and the plot becomes more twisted and intriguing. Taylor, the renowned bully of Jayden and his friends, has been acting peculiar. He disappeared for a couple of days, then reappeared and went on a rampage. Meanwhile, Scarlet is having the fight of a lifetime. She is under attack from an experienced hacker. Will she be able to fight them off? Mysterious things are found at Ernest State College that have nothing to do with who Dr Ernest is tracking. Brendan, the surrogate, goes on a field trip with Hayley, Liam and Dryden. What they discover rocks Brendan’s world and significantly changes the future. One of the aspects of Taylor’s Plight that fans of the series are sure to find interesting is that bully Taylor is different in this book. Without giving too much away, what can readers expect to learn about Taylor? Taylor becomes more aggressive, and his bullying tactics are more intelligent and are not stemmed from sheer brute force. This is part of the puzzle through the book that is discovered close to the end. Fans of your series seem to really like that you’ve managed to incorporate elements from a bunch of different genres (mystery, adventure, suspense, etc) into the plot. Is that something you do intentionally? Or is that something that just happens naturally as you develop the story? For this series it was always my intention to have these incorporated into the plot but as I continue with the series it just flows out naturally. I want my readers to enjoy the adventure and attempt to solve the mystery. For me, suspense is a must for a good storyline. It pushes readers to continue. Many readers also enjoy the humorous parts mixed with a few sad ones. I want readers to feel like they are living in the characters shoes. In Scarlet’s Escape, we learned a lot more about Scarlet. She also plays a big role in Taylor’s Plight. Was she always a character you wanted to be a major player in the series? Scarlet will be a big part of all the books in the series. She is the AI and can be almost everywhere at the Sanctum. She is also a personality that will stand out - feisty, cheeky, intelligent, and doesn’t put up with nonsense unless she is causing it. She is also evolving. As you’ve progressed through writing the series, has it been easier to write the books, since you’ve gotten to know the characters so well? Or has writing the later books taken just as much time and effort as the earlier books? Each book is so different. The characters are easier to write in and develop, but as the plot twists increase, it is harder to make sure they all line up in the end and flow through the book from past books through to plans for future books. This can increase the writing time or at least the plotting time. The sound of helicopter blades chopped overhead. The view below of the jolting skyline mixed with parks and trees was picturesque and peaceful. Kensington City was such a stunning sight and what better way to look at it than on such a beautiful day. The sky was clear and the sun was shining with only a couple of fluffy white clouds in the distance. Avando lent forward and rubbed his leg through his deep blue suit. The wound that partially maimed him, the one that he had received that fatal day when he had lost his wife Atasha and daughter Tamara, still played up from time to time. After he completed giving his leg a rub, he lent his grey speckled dark haired head back in the tan leather seat situated in the luxurious interior of the helicopter, and stretched his legs out in front of him. He reached down and took the coffee cup off the small mahogany table, sipping its contents and welcoming the effect the caffeine had on his body. The pocket inside his deep blue jacket began to vibrate with the ring tone following not far behind. He reached his thin ageing hand into his pocket and looked at the screen for a moment noting that the caller ID was blocked. Frowning over his protruding bumpy nose, he slid his thumb across the screen to answer the call. “Your first deed to be thanked for will be happening in the middle of Kensington City,” the voice hissed. “Be prepared for the iconic building in the middle of the city to be turned to rubble in ten minutes. Congratulations on your achievement.” The phone went silent. Avando’s olive skinned face turned white. Innocent people were about to die. “But that would be dangerous and what would you even look for?” Charlie tried to talk him out of going. “Just get me there, now!” Avando demanded. “They said it was my fault. Get me there. I am ringing the police to let them know.” He let go of the speaker button. He still had his phone in his hand and was ringing the emergency number. “What emergency service did you require, Police, Fire or Ambulance?” A lady’s monotone voice could be heard at the other end. He waited nervously as he felt the helicopter descending to land. “Kensington Police Department, Please state your name, number and your emergency.” A direct male voice sounded on the line. “I have just received an anonymous call stating an iconic building, which I'm assuming is the glass bridge over the Dyson River, is about to be brought down into rubble. You need to get a bomb squad down there immediately. I was told we have eight minutes left." Avando was official and straight to the point. “Thank you sir. I need your name and number sir, in case—”Avando hung up and unbuckled his seatbelt. Charlie had landed the helicopter. There was no time to waste. Avando climbed out of the tan leather seat, opening the door to exit.